For office space that fulfills all your business needs, look no further than The Brooks Executive Suites in the Estero/Bonita Springs area where a range of affordable, professional office solutions await. Move in and get to work straight away with our quality office solutions. 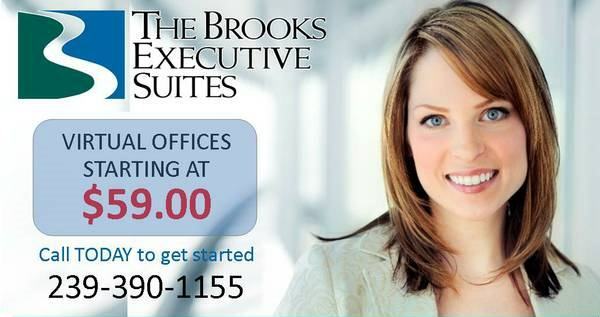 Whether you require an Executive office, a highly efficient Virtual Office or simply a prestigious business address where you can hold client meetings, The Brooks Executive Suites offers the most comprehensive and cost-effective Office and Virtual Office solutions available in the area. A selection of meeting rooms is available so you can successfully host important clients. Our administrative staff make it a priority to anticipate all of your needs are met. Appear effortlessly professional with help of our well-designed meeting rooms that can occupy 6 to 45 people. We are located directly between Fort Myers and Naples and are less than 2 miles to 75 and less than 1 mile to 41. The Brooks Executive Suites have a live receptionist. We offer phones, voicemail, high-speed internet, the use of 5 conference rooms and a business office. We have a coffee service, 5 kitchens and a break room. There is ample parking with security cameras around the building and parking lot lights. The offices are cleaned twice a week. We also have a monthly newsletter that is published and a monthly tenant appreciation event The Brooks Executive Suites hosts. Please contact The Brooks Executive Suites at 239-405-6300 and ask for Julia to schedule a tour to see our facility and get additional information regarding our services. For additional information on other properties for rent or for sale, please visit www.phoenixbayventures.com.